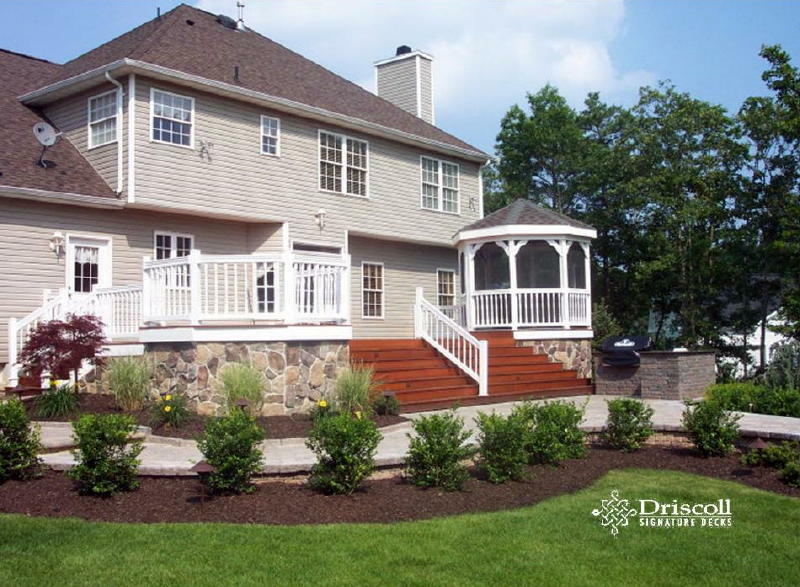 This Driscoll Solution story starts with a these Toms River Decks and a fabulous mahogany decking boards with a large flared stairs, two-12′ octagons, one screened-in gazebo, decking patterns, white vinyl railings, lovo accent lighting PLUS hardscape stone veneer under the deck, paverstone walkways to the pool & side AND an outdoor kitchen – WHEW..! 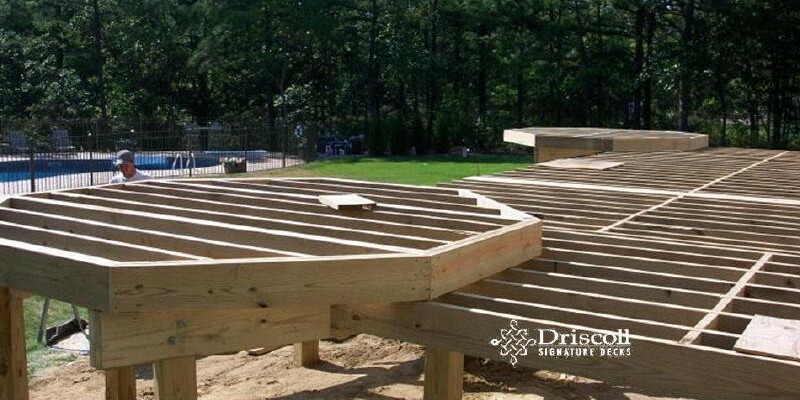 We always recommend starting with a well-designed set of Driscoll Signature Deck – Plans! 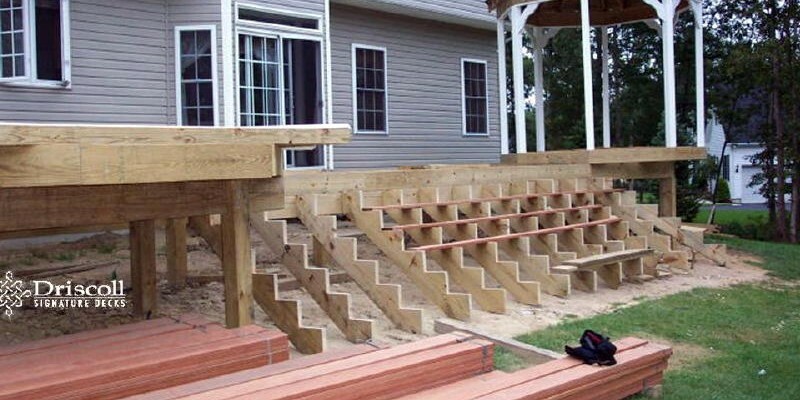 Please note the attention to every detail to build this custom deck. 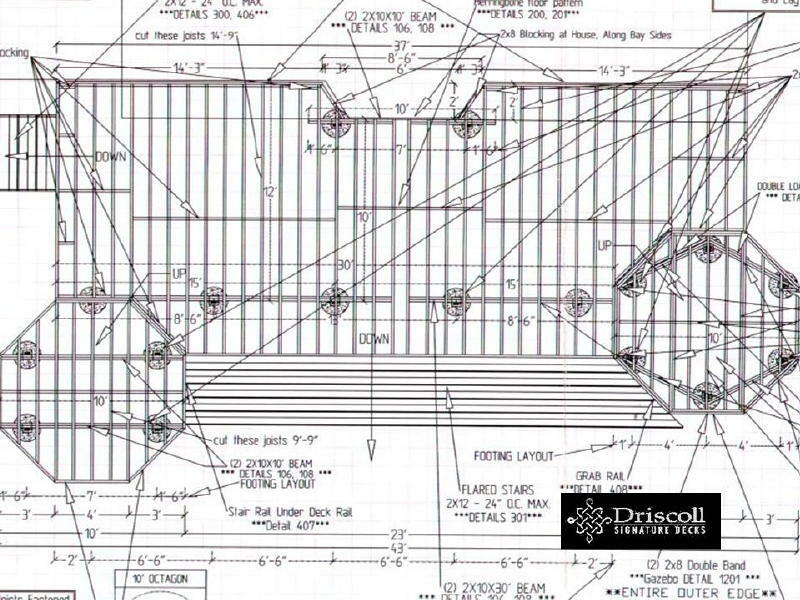 At Driscoll Decks we like to get it right on paper – first. 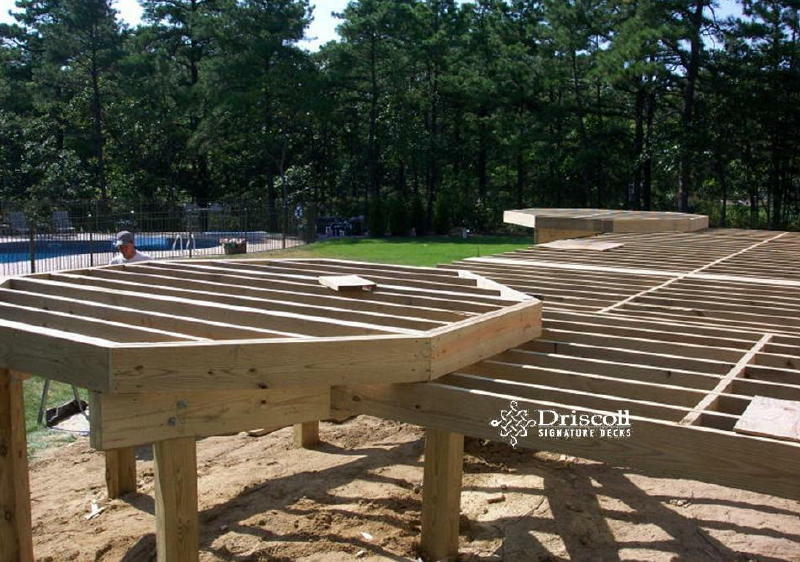 Every Driscoll deck design starts with our robust structural framing. 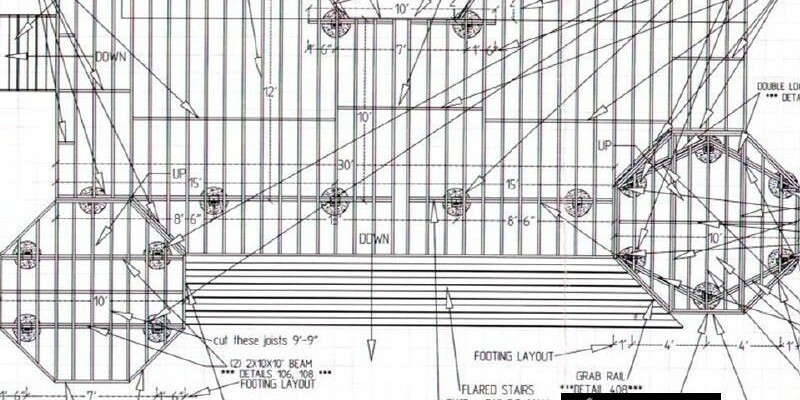 Please note this octagon in the foreground has six (6) structural posts, as per the above deck design or building plans. It is because this octagon is built to support the additional weight of the roofed gazebo, and that is the reason for the additional posts. 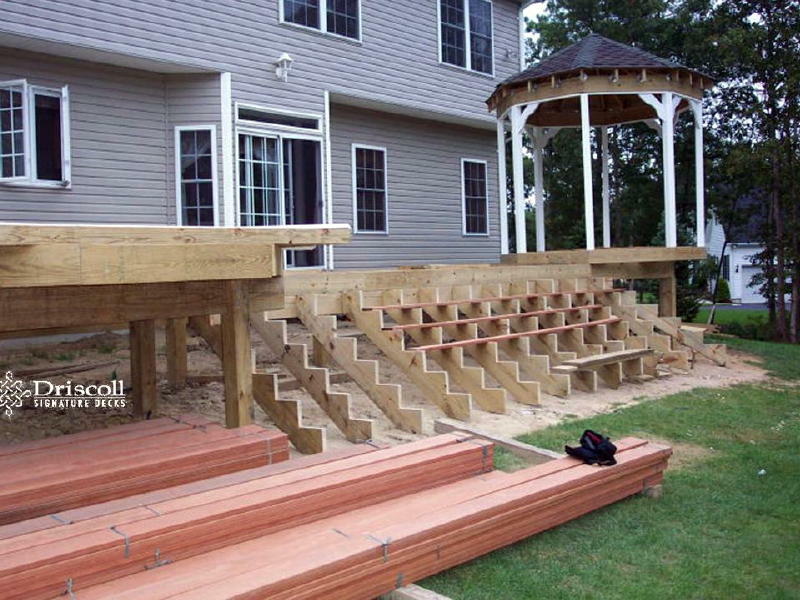 Setting the stringers for these special Driscoll Signature 20′ x 34′ Flared Stairs. Please note those beautiful neatly stacked piles of the best mahogany decking boards, AND the gazebo is now in place and ready to be finished. 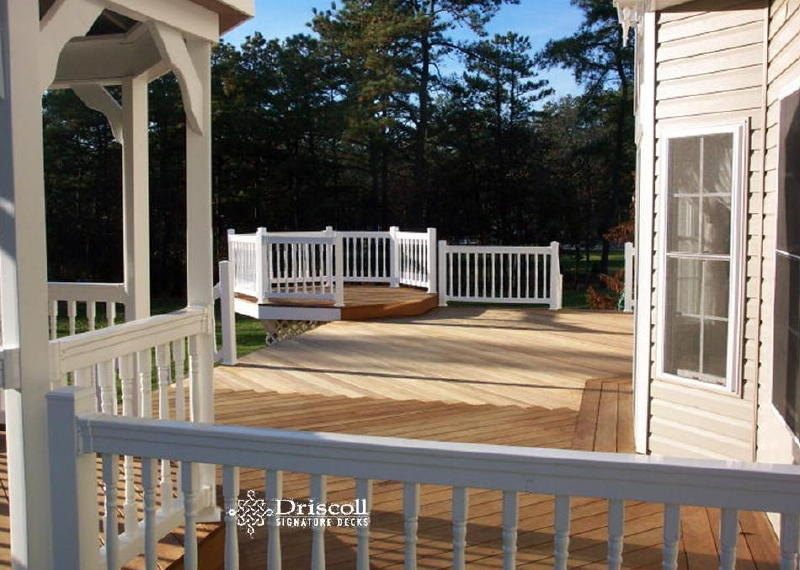 Please note the traditional Driscoll picture-framed and herringbone centered mahogany decking board patterns. Also note the white vinyl railings with matching fascia boards on the outside of the far octagon, but also note that we used a mahogany riser for the level change on the deck itself. This image was taken before we screened in the gazebo, but most of the rest or the work on the fabulous Driscoll Signature Deck is now completed. 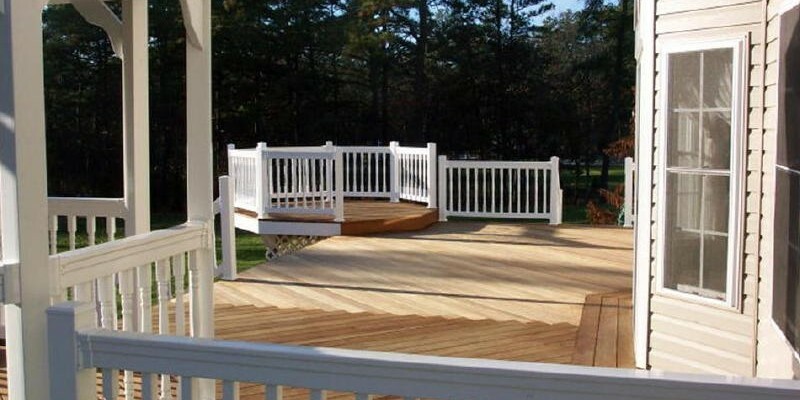 This is now a completed Driscoll Signature Deck with a screened-in gazebo, large flared stairs with a center stair-railing for safety. 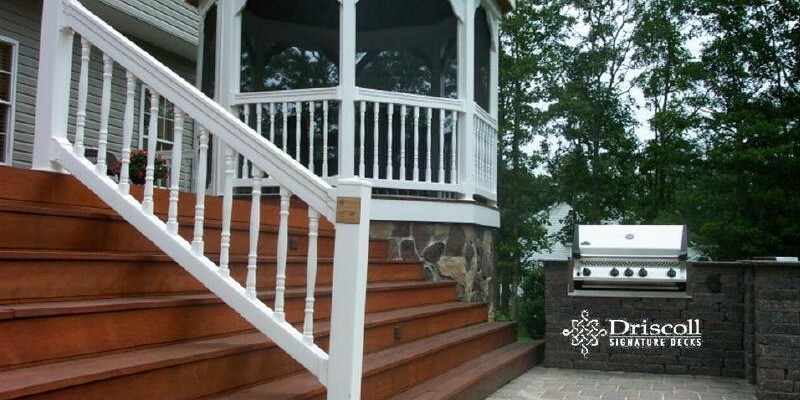 You should also note the stonefacing veneer under the entire deck because the homeowners did not like the look of the white lattice. 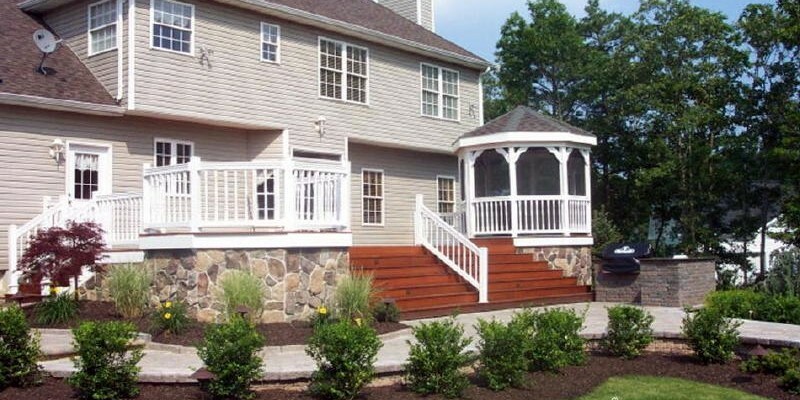 We also built paverstone walls & walkways from the driveway side around the front of the flared stairs down to the swimming pool and pool house. 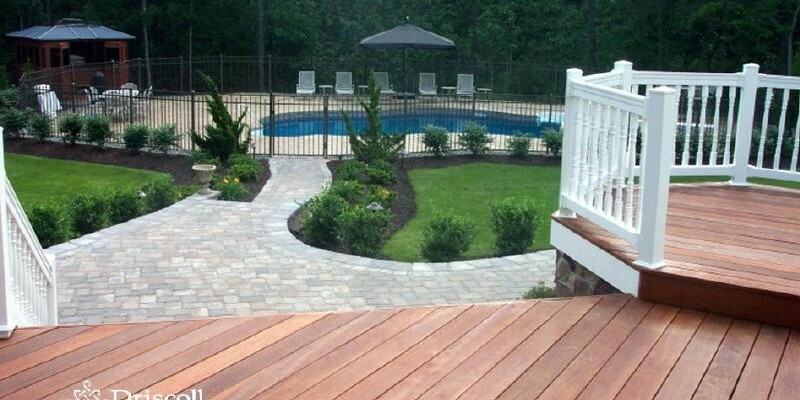 This image shows the wide-curved paverstone walkway from the flared stairs down to the pool. 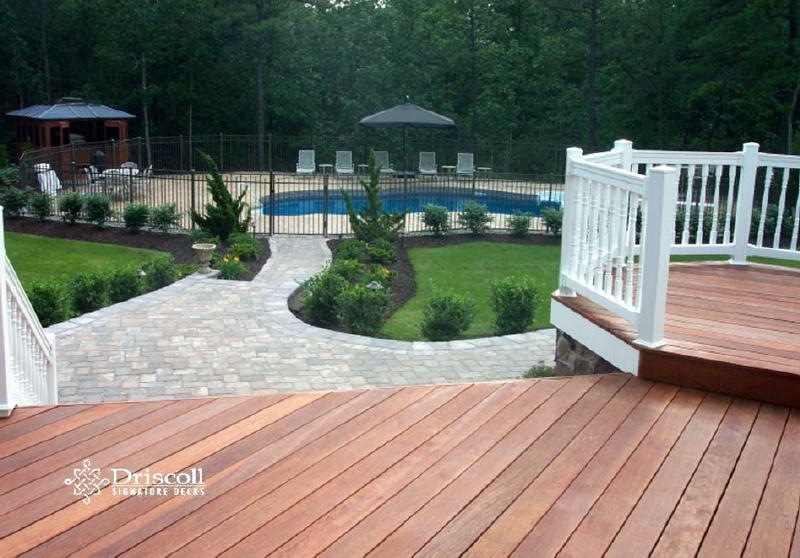 Note the beauty of these rich-mahogany decking boards with the level change at the right side octagon, perfect for a dining table, with a great view of the action in the pool. Please note the Driscoll Signature Plaque on the stair-railing post. We are proud of our work and make sure everyone who works on it signs it for you. 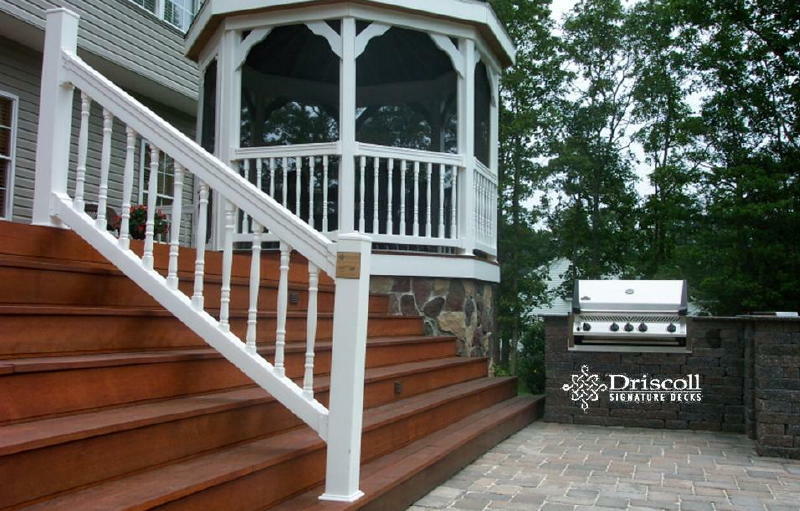 Now this Driscoll Signature Deck would not be complete without a outdoor kitchen, ready to start the grilling.